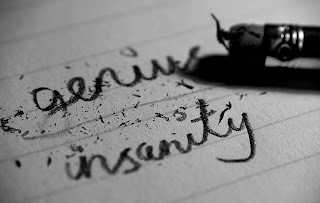 The line between insanity and genius is a very fine one. There is one particular scientist that comes to mind when I hear this saying; a scientist who, because of his tendency towards the absurd, was overlooked in his time. A man who not only won the Edison Medal in 1917, has an international unit named after him, and a distinguished award presented in his name each year*, but an obsessive compulsive, a great lover of pigeons, and a strong believer in Martian life. I am of course talking about Nikola Tesla. 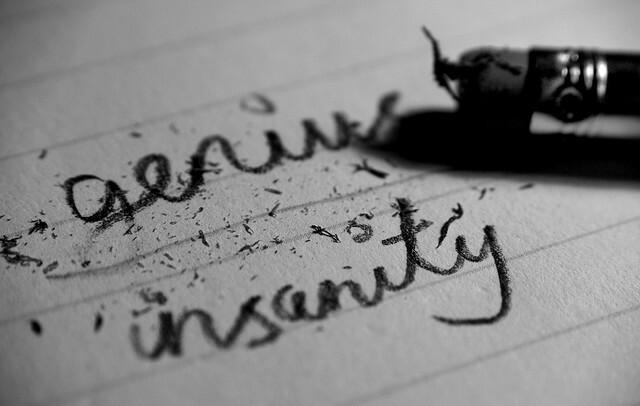 Tesla could easily be considered the greatest genius of the 20th century. His inventions and discoveries are integrated into many aspects of our lives today. Tesla is indisputably the father of AC. Like many great inventors Tesla was a true renaissance man. He crafted his own tools, built his own machines; he practiced and consulted as an electrical engineer, handled his own press relations with dexterity, and was even known to write poetry. He was also an environmentalist, a health and nutrition advocate, a philosopher and many would say a visionary.1 He had the remarkable talent of charming and astonishing his admirers while at the same time enraging his enemies. Nikola tesla was born the 4th of 5 children to Milutin Tesla and Djuka Mandic on July 10th 1856 in Samiljan, Lika which then was part of the Austro-Hungarian Empire, region of Croatia. From a young age he displayed an eidetic memory, though for Nicola this was often accompanied by bright flashed of light and the inability to distinguish between involuntarily visualised scenes and reality. Nikola Tesla was an exceptional student and was afforded a good education; however, his ambition frightened his teachers who feared for his health. In his second year at a Polytechnic school in Graz, Austria he saw a demonstration of the DC dynamo. Tesla remarked that it would be possible to design an AC motor that would not require a commutator, a component which caused the DC dynamo to spark. These claims caused even his professors to abrade him in front of the class and humiliate him Tesla took this as a challenge to prove them all wrong. In his third year he developed a gambling problem which caused him to fail all of his exams and he left the school. Nikola Tesla was a self-taught genius, with an abundance of ambition and enough connections to get him jobs. He started working for his Uncle in Budapest as an electrical engineer for the American Telephone company. In 1884 he went to the USA with only the cloths on his back and a letter of introduction to Thomas Edison in his hand; he soon had a job at the Edison laboratory in West Orange. While there Tesla found many ways of improving the Edison dynamos to increase theie output and lower operating costs, but after a lot of work and changes were made Edison refused to pay him. Tesla immediately resigned and began work on his own projects. Tesla could not find a job that would give him enough money to get the materials needed for his designs and ended up working as a day labourer digging ditches. His Foreman became impressed with the inventions that Tesla spoke about and through this an officer of Western Union Telegraph Company became interested. The Tesla Electric Company was formed. The laboratory was located on a street which is now West Broadway. It was there that the “War of Currents”, which split the electrical industry for years, began. The “war” between Edison’s DC and Tesla’s AC was a long one that involved prominent investments and propaganda campaigns instigated by Edison. Despite the dirty dealing of Edison and his campaign against Tesla’s AC, Tesla won the bid for illuminating the Chicago World fair which opened in 1893 and twelve thousand-horsepower AC generation units illuminated the “city of lights”. Later that year Tesla realized an idea he had as a boy, to harness the power of Niagara Falls by building huge underground conduits leading to turbines; once again beating out Edison for the project. In 1899 he moved to Colorado so that he would have more room to conduct his high-frequency, high-voltage experiments. While there he regularly used his radio broadcast equipment as a sensitive receiver to monitor passing thunderstorms. He noted periodic signals that did not correspond to any noted storms. Tesla attributed these to an extra-terrestrial source probably Mars as there was no commercial radio traffic in the 1890’s. Tesla was not alone in the belief of life on Mars and even prominent figures at the time came to Tesla’s defence when he was criticized for claiming to have heard their signals, saying he believed they were trying to communicate. 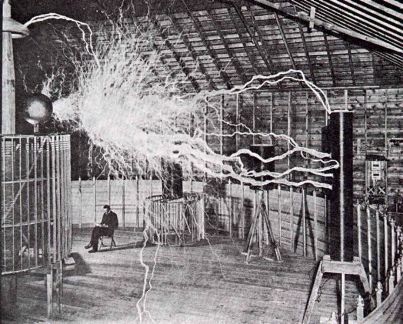 Tesla’s reputation and credibility, however, were severely damaged making him seem unscientific and reckless2. As a result of his intent to communicate with Martians he was the first scientist to use the ionosphere for scientific purposes. In his life time Tesla was awarded and was able to convince a large number of people to invest in his ideas and as a result is responsible for a number of revolutionary designs such as the first electric car and wireless communication systems. However, he was also known for being too ambitious and was never to budget. Despite his success with the AC motor he suffered from severe financial hardship and was forced to move from hotel to hotel for a majority of his adult life. Tesla had also developed a number of obsessive compulsive behavioural traits from a young age displaying a strong aversion to women’s earrings and round objects, or touching other people’s hair. The men who knew him have told of his eccentricities, perhaps natural in a man who had always lived alone, with no-one but himself to think of. He brought a new pair of gloves and necktie each week and threw them away no matter what their condition. He always had a handkerchief but discarded them as soon as they were used. He always demanded that he have exclusive use of a table in the dining room of whatever hotel he honoured with his presence. When the meal was served he used two dozen napkins and after wiping each dish with one he would drop them on the floor3. Tesla had difficulties with several of the hotels he stayed in when his love of pigeons led to him rescuing injured pigeons from central park and taking them back to his room. Some also reported that pigeons flocked to his room in their hundreds to be fed. In a number of cases he was told to desist with these activities or he would be asked to leave. Towards the end of his life Nikola Tesla refused to leave his hotel room and even his friends were not permitted to see him, though he insisted to them that he was not ill but that he didn’t want to be disturbed. Tesla died of heart failure on January 7th 1943 at the age of 86 in Hotel New Yorker where he had lived for 10 years in room 3327 on the 33rd floor. Despite being popular in his day now Tesla remains largely overlook on the list of inventors and scientists of the modern era. In his lifetime, Tesla was granted over 100 patents and could have exceeded Edison’s record number had his funding not been continuously cut. Thomas Edison is often credited with inventions that were developed and patented by Tesla, this can be seen in a number of school textbooks as well as at the Smithsonian museum his AC generators are included in the exhibit on Thomas Edison. The US Supreme court also affirmed Tesla’s patent for the invention of radio over Marconi’s in 1943, where 15 out of 16 of Marconi’s patents were invalidated, yet he still gets no credit for his contributions. Many of Tesla’s theory died with him and he rarely documented how he came to his conclusions, yet many years later some of the theories he came up with that were regarded as outrageous, are now in the forefront of scientific discovery. Tesla is an overlooked Genius who had original ideas way beyond his time and thus was left unrewarded for his originality. Who is your favorite scientist/engineer/visionary?